MSc Chemistry at St.Teresa’s College started in the academic year 2013-14 as an aided course with twelve seats. The department has well-equipped chemistry laboratories with instruments enabling the students to carry out all the experiments that are included in the syllabus as well as to conduct simple projects. Students can also utilize modern computer lab to conduct research and study. The library has a good collection of books also apparatus and equipment are kept safely in a store. Highly qualified and motivated faculties of the department conduct the classes for MSc Chemistry. Some of them are involved in research studies. Teachers use tools or methods like powerpoint presentations, assigning students with topics to conduct presentations to get effective teaching and better understanding. The syllabus is designed in a way that students can have a deep understanding in specialized fields. 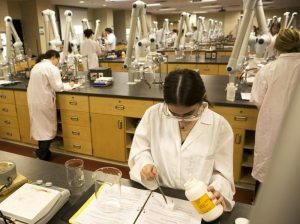 Students are also provided with elective programmes in MSc Chemistry like Organic, Inorganic, and Analytical Chemistry. The department focuses on improving the knowledge as well as skills of the students. As an educational institution, we strive to imbibe curiosity, technical skills and enable them to have an awareness of social and environmental issues. Faculties also inspire and encourages the students to engage in research. The course is designed to meet the challenging needs of the society. Besides the lecture program, students will be given assignments, seminars, group discussions, projects etc. The chemistry department is innovative and pioneering research in wide areas of Chemistry.